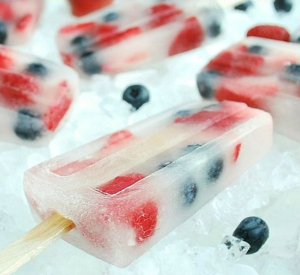 This 4th of July we are adding in some color to the fun by switching up the some old staples you usually see with these fun nutrient filled bites. Having more color on your holiday party table allows for more chances to get in variety along with fruit and veggies!! Stay cool and hydrated with these great Coconut water chillers. Coconut water is a great source of potassium helping you stay hydrated during the hot summer weather. Who doesn’t love bacon and BLT’s?! 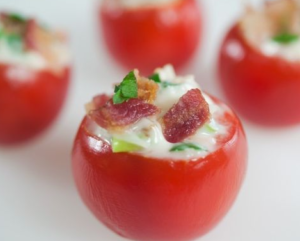 These little bites give you all the flavor of a BLT without all the filling of the entire sandwich. 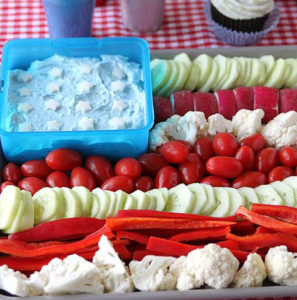 We have all seen the fruit flag tray so this try to add in a bit more fiber an crunch with the vegetables. 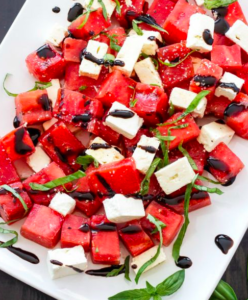 Grilled Watermelon, Feta, and Basil Salad Sweet grilled watermelon, salty feta, and fresh basil taste so good together in this summer salad! Watermelon is a great source of vitamin C. It is also a good source of pantothenic acid, copper, biotin, potassium, vitamin A (in the form of carotenoids), vitamin B1, vitamin B6, and magnesium. 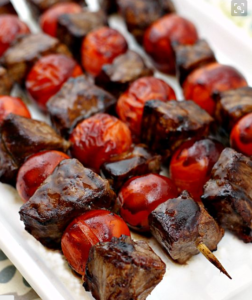 Balsamic Steak Skewers ~ Tender Steak Marinated in a Tangy Balsamic Vinaigrette and Grilled to Perfection! Beef is a great sources of vitamin B12 and very good source of protein, niacin, vitamin B6, selenium, zinc, and phosphorus. It is also a good source of choline, pantothenic acid, iron, potassium, and vitamin B2.